Ziegler’s Grove, a prominent feature on Cemetery Ridge, was the location of fierce fighting on the 2nd and 3rd days of the Battle of Gettysburg (July 2-3, 1863). (About) Pickett's Charge from the Confederate position, with Ziegler's Grove on the left and the copse of trees on right. By Edwin Forbes. Library of Congress. This small grove of oak, hickory and chestnut trees on the northern end of Cemetery Ridge marked the general positions held by General Alexander Hays' Division of the Union Second Corps. 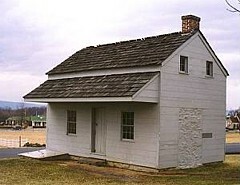 Adjacent to the grove is the Brian farm and farm buildings, including the small farm house used by General Hays for his headquarters. Artillerymen had set up their guns at the edge of the woods, which also provided shade from the warm afternoon sun. The grove was the only tall stand of trees on this portion of Cemetery Ridge which turned sharply eastward at this point to join into Cemetery Hill. Hays' men, with several regiments of the First Army Corps nearby, enjoyed a clear field of fire in three directions from this location and his skirmish line had successfully kept General Robert Rodes' division at bay during the second day of the battle and again on the morning of the 3rd. Stretching southward from Ziegler's Grove was a line of stone walls that provided natural protection for the infantry regiments here and Hays' men used these strong walls for defensive positions. Rails that added height to the walls were taken down and piled on top of the stones to add height for the men kneeling and standing behind them. 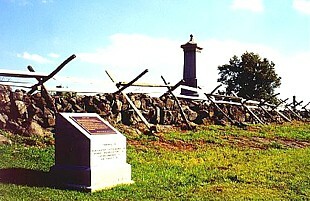 During Pickett's Charge, the wall south of the Brian barn bristled with infantrymen who fired down at the Confederates crossing the Emmitsburg Road, approximately 200 feet away. (Left) Picture of the stone wall on Cemetery Ridge behind which General Hays posted two brigades of his division. Gettysburg NMP. The Confederates who struck this portion of Cemetery Ridge were under the command of Brigadier General James Johnston Pettigrew and Major General Isaac Trimble. Halted by heavy musketry from Hays' line, the Southerners also suffered cannon fire from Union batteries on west Cemetery Hill and in Ziegler's Grove. Though many soldiers halted in the road to return fire, others followed their flag bearers over the fences and continued towards the stone wall. Soldiers fell by the dozens, but the flags continued forward. General Pettigrew had just conferred with General Trimble near the road when both were severely wounded, Pettigrew in the hand and Trimble in the leg; no supports could be seen coming to their aid. A lone Union regiment, the 8th Ohio Infantry, swung into the Southern left flank, sending deadly rifle fire down the road and hitting the crouching Confederates. The Confederate flags disappeared, fallen into the smoke, not rising again as bearers and supporters were killed or wounded. There was nothing left for the painfully wounded Pettigrew to do but order a retreat. Just as the last few shots echoed over the hills, General Meade arrived on the scene behind Hays' line. Seeing the Confederates in retreat, the general waved his hat and shouted a hoarse "Hurrah!" as a Union band struck up "The Battle Cry of Freedom". General Meade knew that his army had given Lee a telling blow, but his had also suffered severely during the battle. Satisfied with the day's results, Meade decided to hold his commanding position and wait for Lee's next move. 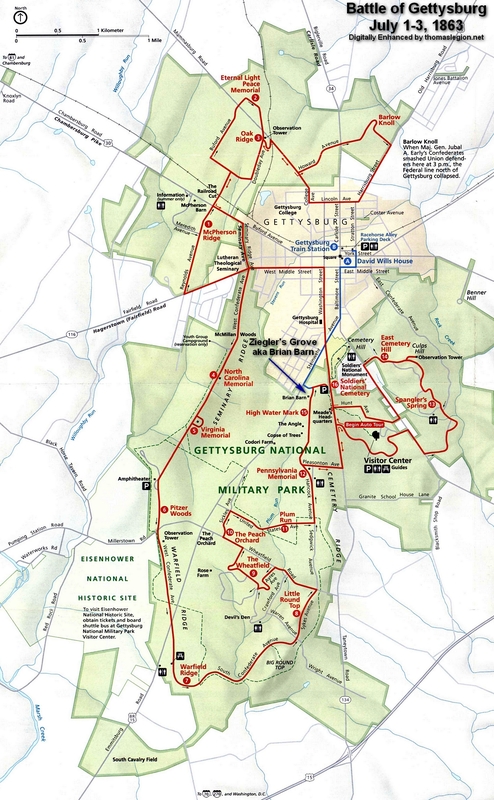 Apart from a skirmish on the southern flank of both armies, the Battle of Gettysburg had drawn to a bloody close. General Hays encouraged his soldiers throughout the battle, his booming voice rising above the din. After the Confederates had retreated, a captured Confederate flag (one of fifteen taken by his division) was brought to the general by one of his men and the jubilant Hays dragged the banner through the dust in front of his division to the accompaniment of hurrahs and lustful cheers. To the soldiers of his division that had been humiliated by their surrender to "Stonewall" Jackson at Harper's Ferry in 1862, their part in the repulse of Pickett's Charge restored the honor many felt had been lost. 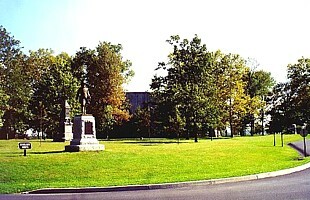 Gettysburg was a high point for General Hays' military career. After reorganization and consolidation of forces within the Army of the Potomac the following year, Hays was re-assigned to command a brigade in the Second Corps. Accompanying his good friend and commander of all Union armies, General Ulysses S. Grant, General Hays led his brigade into the opening of the Wilderness Campaign in 1864 and was killed at the Battle of the Wilderness on May 5th. Posthumously awarded the rank of brevet major general on the day he died, Hays' remains were taken to Pittsburg where he was buried. A monument in his honor now stands in Ziegler's Grove. 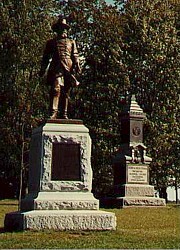 Erected in 1915, the sword wielding bronze likeness of the general overlooks the fields of Pickett's Charge. 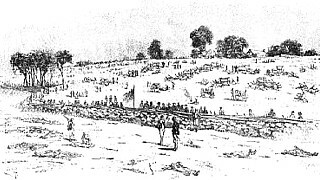 (Left) Picture of the "Angle" and clump of trees after Pickett's Charge, drawn by Edwin Forbes. Battles & Leaders. Squads collected over 2,500 discarded rifles and thousands of sets of accoutrements from the field in front of the Second Corps. The grisly job of burying the dead was also left up to the Union soldiers who buried their own before turning their attention to the hundreds of Confederate bodies lying in front of the stone wall. The remains of 1,242 Southerners were buried along the Second Corps front in long trench graves, among them the body of a female dressed in Confederate uniform. The shocking discovery led to speculation that the young woman had followed her husband into Confederate service dressed as a male to hide her gender, though her true identity forever remains a mystery. The fields where Pettigrew's and Trimble's commands marched have changed very little except for the encroachment of modern homes in the borough of Gettysburg to the edge of the historic Bliss Farm. In 1913, the Great Camp was set up adjacent to the area for "The Great Anniversary and Reunion of 1913." In 1917, "Camp Colt" was established on this site and was the first US Army camp authorized to train the fledgling army Tank Corps during World War I. Captain Dwight D. Eisenhower commanded Camp Colt. All traces of this historic camp are gone except for a commemorative tree and marker planted adjacent to the Emmitsburg Road on the general location of the camp. Another war brought another US Army camp, yet for a very different purpose. A temporary compound that held 300 German prisoners of war stood in the field on the west side of the Emmitsburg Road for approximately six months in 1944. The German prisoners were used as labor to pick and process fruit, cut and mill lumber, and make road and trail improvements in Adams County. Like Camp Colt, all traces of this camp are long gone, the fields having returned to their more peaceful use in agriculture. Thankfully, one company of the 11th Mississippi Infantry Regiment was spared during the first day of battle; however, it was not so lucky that fateful afternoon. In 1861, approximately 110 students at the University of Mississippi left the classroom to enlist in the army and were accepted by the state as Company A of the 11th regiment. "Impulsive and undisciplined", the new soldiers were slow to follow military discipline but were always ready to be "in the front" of a battle. Only 31 members of the Greys stood in the ranks on July 3 and set out behind the colors of the 11th to drive through a supposedly "shattered Yankee line." Instead, the company was whittled down by Union cannon fire. "Pressing onward," Lt. William Peel recalled, "our line was melting away with alarming rapidity... reduced to a mere skeleton. Still, on it pushed, with a determination that must ever be a credit to the Confederate soldier." Eight color bearers of the 11th were shot down before the flag staff was cut in two by a minie ball. A small handful of Mississippians crowded behind the flag and made their way to the Brian Barn where the bullets flew thick and fast. Within minutes it was over. A handful of the 11th escaped through a gauntlet of fire to Seminary Ridge. Of the 394 officers and men that began the charge, only 53 answered the roll call that night. No one answered from the University Greys. Every last one of those former students had been killed or wounded in the great charge at Gettysburg. Abraham Brian (Bryan) was a free black man who resided in Adams County prior to purchasing this twelve acre farm on Cemetery Ridge in 1857. Brian had been left a widower with five children to support; then he married for a third time. With his wife Elizabeth, the two moved their large family into a small farmhouse adjacent to Ziegler's Grove where he evidently felt he could better provide for his family as a farmer. Brian kept a horse and a cow and planted wheat, barley, and hay in his small fields. He also groomed a plentiful apple and peach orchard adjacent to his house. This quiet farm life was shattered during the first three days of July 1863. The arrival of Union troops on his doorstep late on the evening of July 1st, hastened Brian to gather his family and leave. He returned after the battle to find his home ransacked, walls filled with bullet and shell holes, windows smashed, and furniture dragged into the yard. Fences were destroyed, crops trampled and the orchard trees ruined. The pasture west of the barn was a huge graveyard. Brian could do little but attempt to repair the extensive damage and rebuild his life. He continued to farm the land until 1869 when he moved into Gettysburg and took up work at a hotel. Some years later, Brian filed a claim for damages to his property totaling $1,028. Unlike most claimants, Brian was compensated a mere $15. He died in 1875 and is buried in Gettysburg next to his first two wives. Very little is known about Abraham Brian today though his farm remains part of one the most historical sites in the United States. 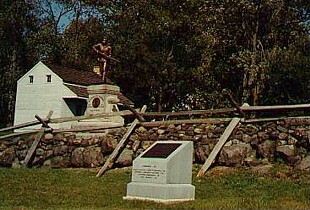 A reconstructed house and barn are mute testimony to the shattering effect the battle had on Mr. Brian and other Adams County civilians. Sources: Gettysburg National Military Park; National Archives; Official Records of the Union and Confederate Armies; Library of Congress.